You are not astonished anymore that I'm a big fan and give highly up of the old De Smet-Matthijs strain. Luck was on my side undoubtedly when I got hold of a fortune of direct De Smet-Matthijs birds from Georges Veys, who found their roots directly in the birds of the golden fifties and sixties. I just want to tell you something about "De Oude Kapoen '67". His father was "De Oude Kapoen '60" grandson of "De Goede Zwarten" with a daughter of the worldfamous "Prins" of Hector Desmet. "De Kapoen '60" won the 1st National St. Vincent and the 1st National Brives. The mother of "De Kapoen '67" was "Het Prinseske" daughter of "De Oude Klaren '46" and a daughter of "De Schonen", so "De Oude Klaren '46" was put together with his granddaughter! I dare to say that he was a world-class breeder. Why?? 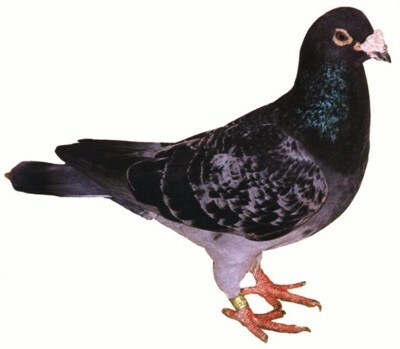 Did ever fly a better pigeon than his son "De 312"?? On his prizelist are 7 first prizes on 7 different races in big competition against thousands of birds, a title as National Ace and three National Ace titles in three years time on the short distance within the best 4 in a National competition. I invite you to give me the name of a better pigeon. And: his own brother "De 411" is at this moment THE basic breeder of my loft through his daughters "De 150 Duif" (the partner of "Het Boerke", the halfbrother of "De Goede Jaarling") and "De 646 Duif" (the mother of e.g. "De Goede Jaarling"). Vloog er ooit een betere duif dan zijn zoon "De 312"?? Op zijn erelijst prijken 7 zuivere eerste prijzen in groot verband tegen duizenden duiven, een 1e nationale Asduif titel en drie titels binnen de eerste 4 nationale asduiven op de vitesse op drie jaar tijd. Ik daag u uit mij de naam van een betere duif te noemen. After "De Oude Klaren '46", "De Kapoen '60" was at the De Smet-Matthijs loft the most important breeder. The basic breeder of Prof. Norbert Kricke of Düsseldorf (Germany) was a son of "De Kapoen '60" and "Het Prinseske" (daughter to "Oude Klaren '46""). He had tremendous breeding results into the sixth generation with these birds. I think next of "De Notekraker", son of "De Kapoen '60" and a daughter of "De Kleinen", who won on his own the Belgian National Long Distance Marathon. The world famous double St. Vincent National winner of Thomas Peeters & Son of As is a grandson of "De Kapoen '60". 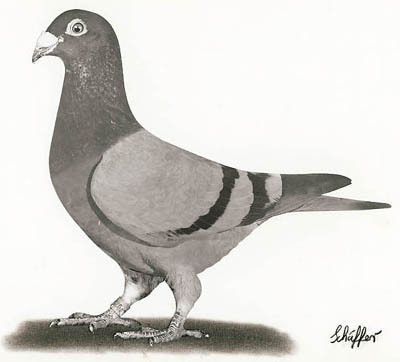 Numerous Ace pigeons and National winners have this bird in the second or third generation. For instance De Baere Brothers of Nokere, Daniël Van Ceulebroeck of Balegem and the late Stan Raeymaeckers who kept them quick by the crossing with the Houben's. That's why "De Kapoen '60" is the most important breeder of the De Smet-Matthijs strain after "De Klaren of '46". But let me be honest to tell you that I was not very much impressed in the first place of "De Oude Kapoen '67". He was very big and skinny, but showed however enormous will-power and personality. In your hands he kept on fighting, struggling to get away. Pure character and will-power. Athletically build, not in a way: his breastbone was deep and his feathers were not that soft as you would expect. The super eye of "De Oude Kapoen '67". But his eyes..... ohhh, so beautiful. 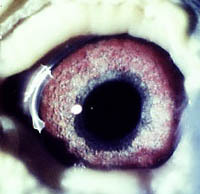 You hardly ever have seen such a full iris with so many spots in lilac and grey in it. The wings he got were so big and apparently missed speed. But as a racer "De Oude Kapoen" won 6 first prizes on races out of Clermont 160 kms; 1-1-1-1-1-1-2-2-3-6-7-7-8-11-11, so he was as fast as lightning with his big body! So he had excellent qualities that could be improved much for sure. The "De Oude Klaren" and "De Goede Jaarling"
De Goede Jaarling Champ of the Champs! De Goede Jaarling and Het Schoon Blauw: Top Class!